Pha That Luang temple, one of the most important places in Vientiane and Laos. 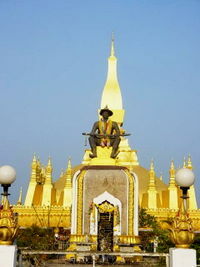 Vientiane is the capital city of Laos. It is in the Mekong Valley, and over two hundred thousand people live in its central area. Wikimedia Commons has media related to Vientiane. This page was last changed on 8 March 2013, at 17:44.